Minor version changes (after the decimal point) correspond to minor changes, essentially cosmetic. Major version changes (before the decimal point) correspond to big important changes. These were collected over the years across the Internet, and are believed to be in public domain (a notable exception to most of this site’s contents published under WTFPL); many come from the excellent SwissRifles.com source by the deeply regretted Frank [“Guisan”] van Binnendijk. Règlement de l’armée suisse 65.313 f “Le mousqueton 31 et les mousquetons à lunette mq. lu. 31/42 et mq. lu. 31/43. Directives pour armuriers.” ed. 1967. Schweizerische armee “Der Karabiner (K. 11 und K. 31). Technisches Reglement Nr. T1d” ed. 1944. Ballistic data for your favourite calculator — K31 + GP11 ord. 1934 The firing pin was lightened. 1935 The receiver was made from hardened steel. 1936 The magazine was made from hardened steel. 1941 Stocks made from laminated plywood were tested, but rejected. 1944 Due to supply shortages, Chromium Molybdenum Steel was use in place of Chromium Nickel Steel on various parts. (Recognisable by “+CM” markings instead of the usual “+CN” markings) This experiment proved unsuccessful. 1946 Starting with K31 serial number 868,901, beech wood rather than walnut wood was used for making the stocks. The K31 “best” bore diameter: seven-fifty-what? Almost any Swiss shooter owns a K31. And almost any K31 owner has an opinion as to the “perfect” bore diameter ensuring best precision. We have an opinion too: it does not matter. We conducted systematic tests of many K31s with Waffenfabrik barrels gauging between 7.51 and 7.54, and found no noticeable correlation between bore diameter and group size. Furthermore, the diameter is not necessarily an indicator of how used the barrel is; we have measured bore diameters of several brand new carbines of different production lots and years, and found anything between 7.51 and 7.53 — factory new. The official specs are even more generous; according to the Waffenfabrik K31 blueprints, the nominal calibre is 7.51, but production tolerances are ok up to 7.56. This being said, gauging is useful: barrels which did not have the same diameter over the whole length (one side larger than the other) showed inferior precision compared to fully uniform barrels. Also, barrels gauging 7.55 or above were usually “tired”, and precision started to suffer. This last remark is only valid for K31s only with Waffenfabrik barrels. Hämmerli barrels (rare, recognisable by the “hammer” marking) gauge larger from factory, and at 7.55 usually show totally convincing precision. Also, standard and free ISSF/CISM 300m carbines (which are usually very precise) chambered for 7.55×55 as a rule are built on .30 cal barrels (the same as for .308 Win or .300 Win Mag), and gauge significantly larger — 7.55 or 7.56 factory new. 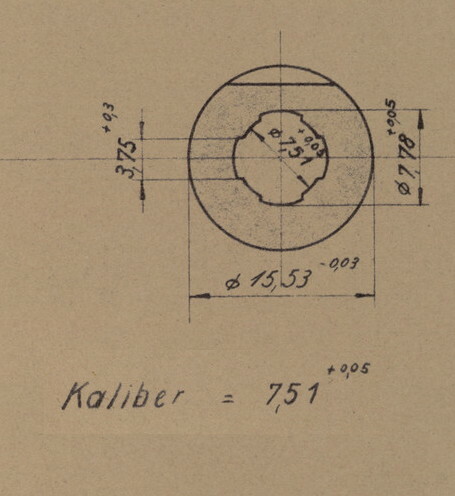 In summary: for a Waffenfabrik-barrelled K31, make sure the diameter is below 7.55 and is uniform across the length (same on both the chamber and the business ends). Beyond that — only the target can tell the ultimate truth. What is the best scope mount for the chassis? Short answer: it depends on the scope. The long answer is at the “Scope + mount, how to choose” page. What precision can be expected from a K31? 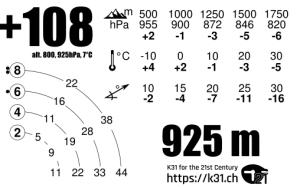 The army manual specifies median (50%) rectangle of 4×6 cm at 300 m at a shooting bench using ordnance GP11 ammo. In other words, at this distance 95% of impacts should land in a 12×18 cm rectangle. Although many K31 barrels are potentially capable to do better than that, the numbers correspond to a shooting bench, without a real shooter behind the rifle. This being said, with a good optical scope (to minimise aiming errors) and a good ergonomics chassis (to minimise shooter errors / “flyer” shots), it is entirely possible to approach these theoretical limits. In practice, a good shooter behind a well-equipped carbine, keeping a slow rate of fire (not more than 1 shot per minute, in order not to overheat the barrel), at 300 m can expect 10-shot series of 96 to 98 out of 100 on a FST A10 target. At systematic 98 points or better, one can consider the barrel to be very, very good.